Added by Andy Hargreaves on June 2, 2014. A £1.6 million project to refurbish the Harbourside building is getting underway. The Duchy of Cornwall will be carrying out the extensive repairs over the next nine months. St Mary’s based contractor Blackwell Building Services is currently undertaking the repairs to the quay surface, following the damage caused by the winter storms. They’ll also be working on this additional project. 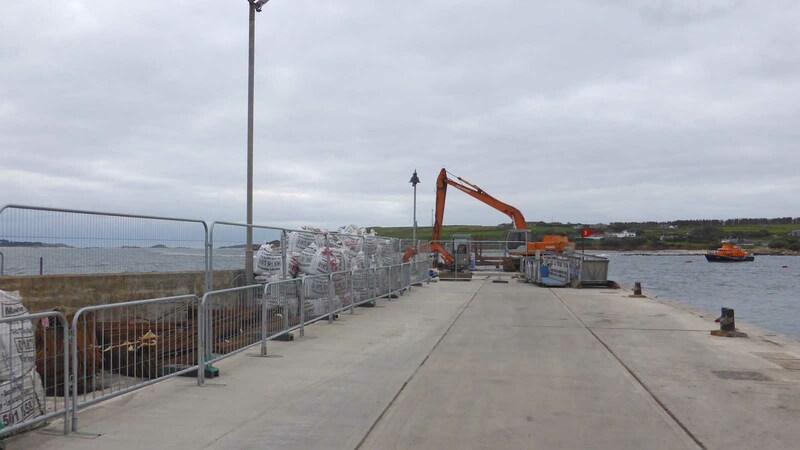 The re-surfacing will be completed once the outer berth wave wall has been replaced. The external works to the front of the Harbourside building will start in the next few days and both of these projects will be finished by the end of July. The Duchy say that the works are being planned to minimise any disruption to passengers and the quay will remain open at all times. A ‘Welcome Host’ will be employed on the quay in an arrangement with the Steamship Company to assist and guide passengers during the building. These works pave the way for the Harbour Improvement Scheme, which will extend the quay. The Duchy expects that to start in late summer when funds are made available for the project. I am so looking forward to visiting ‘home’ for the first time in 4 years but hope all this infrastructure work doesn’t impact upon the general visitor experience. I understand funding deadlines but some stuff should wait another couple of months. Customer service is everything and there is a limit to the disruption of a holiday experience. I do hope it is not too obvious…….. Nothing like doing all of the major building projects in the peak season is there when tourists numbers are down.